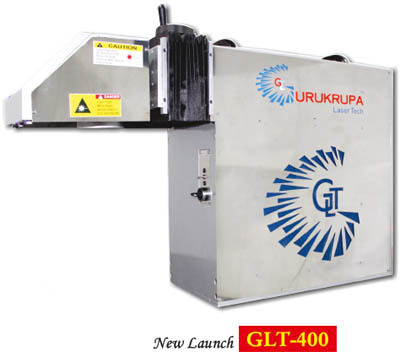 GLT 400 Fiber Laser Machine developed by Gurukrupa Laser Tech with the advanced Technology in the world. It uses Fibre Laser. It is for high power marking and cutting machine for gold, silver and copper cutting up to 1.00 m.m. thickness with low weight loss up to 0.05 % It gives best result in cutting function through high Speed Scanning galvano meter system. Features of this system include efficiency, air cooling, compact size and galvo scanner. It can move 1 to 200 m.m. with X axis which is helpful in multiple marking. This machine is highly reliable, giving Quality out put and energy saving. The marking speed is 3-12 times faster compare to other Fibre machine. It runs on windows os and formats of Autocad. The power of the Laser is controlled by software and it is adjustable. It is specially for Gold Cutting. This machine i.e. GLT 400 is durable Decorative with comfort and Efficiency providing for outstanding features.